Nico Rosberg will start from pole position on the grid for Sunday's Singapore Grand Prix as he aims to win his eighth race of the 2016 season. Nico Rosberg of Mercedes on Saturday got the pole position for Singapore Grand Prix in qualifying session with the week's fastest time of 1 minute and 42.584 seconds. Red Bull's Daniel Ricciardo closely followed Rosberg, ranking the second and Championship leader Lewis Hamilton finally anchored the third place. 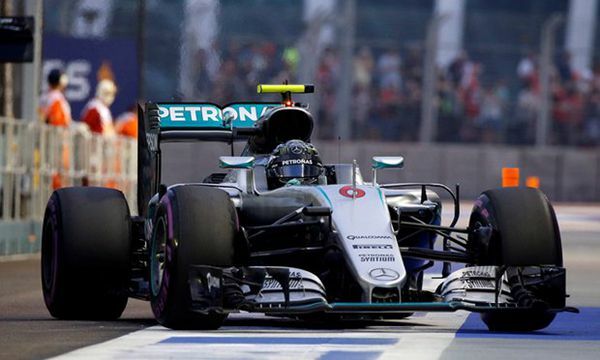 Rosberg led the second practice session on Friday and the third practice session on Saturday. With a good warm-up, the German driver kept the momentum to the qualifying. Rosberg gave a stunning time of 1 minute 43.020 seconds in Q2, and made it even faster in Q3. "That was one of my top three laps ever and I'm so happy that it came on my 200th GP weekend," said Rosberg after the race. Red Bull Racing's Daniel Ricciardo surpassed Hamilton in Q3, joining Rosberg on the front row, with a time of 1 minute and 43.115 seconds. Hamilton has struggled this week. His time of 1 minute 43.288 seconds was set in Q3, ranking the third position. While Red Bull's Max Verstappen, who stood out during Friday's first practice session, ranked the fourth place. However, Ferrari's Sebastian Vettel eliminated in Q1 because of mechanical issues. "We decided to try and pit to fix the car but there wasn't time. I'm very disappointed," said Vettel, who was the champion of the race last year. Singapore Grand Prix is the Round 15 of the 2016 FIA Formula One World Championship, which is the only street racing held at night in the world, with gorgeous night scene around the Marina Bay Street Circuit. The track is 5.065 km long with 23 corners spread over. Hamilton has topped this season's driver standings with 250 points, and his team-mate Rosberg closely followed. Red Bull's Ricciardo ranked the third place with 161 points. As for the constructor standings, Mercedes has anchored the first place with 498 points, followed by Red Bull and Ferrari, gaining 290 points and 279 points respectively.